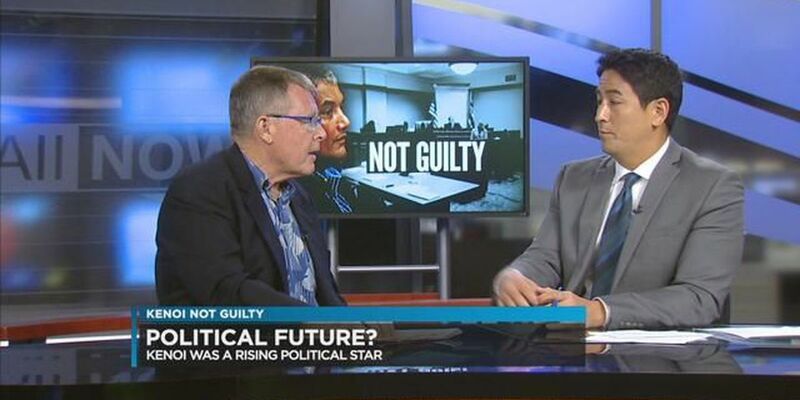 HONOLULU (HawaiiNewsNow) - Honolulu attorney Paul Cunney stopped by Sunrise to discuss with Steve Uyehara the acquittal of Big Island Mayor Billy Kenoi. On Tuesday, Kenoi was dropped of all five charges, which consisted of four felony theft charges and one count of swearing or making a false statement under oath. Three counts of tampering with government records were thrown out by a judge earlier in the trial. Cunney said the burden of this case was on the state because it had to prove that beyond reasonable doubt that Kenoi didn't intend to repay the personal charges he swiped on his county purchasing card. In addition, while the defense was able to provide several witnesses who backed up Kenoi, Cunney noted the prosecution couldn't get anyone to testify otherwise. Cunney said the defense did a "masterful" job in creating their case and lining up the witnesses, but he was also surprised the state took Kenoi to trial in the first place with such little evidence. Even if Kenoi's bar tabs were included in the case, Cunney says the defense could've have made the argument it has made before, which is Kenoi was networking and building relationships over drinks. As for Kenoi's potential future as a politician, Cunney says he has a lot of options such as a private law practice or a lobbyist. He added Kenoi could still be a strong candidate for governor in the future.